Listen to this episode of the 10 Minute Teacher. We're more likely to read things that are visually appealing, so if you want to get your message out there, consider making an infographic. Want to know how? 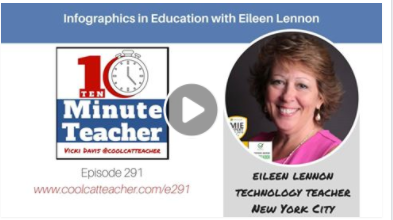 Check out this episode of the 10 Minute Teacher podcast where #NYCSchoolsTech educator, Eileen Lennon shares ideas with Coolcat Teacher Vicki Davis about her tips, tricks, and techniques to using infographics to communicate and share ideas. Use articles or books you enjoy to find content worth summarizing in a visually appealing way. Once you have content selected, reach out to the author for permission to remix, recycle, and share in a new way with audiences. Once you have permission, make sure you to cite your source. Every infographic should have a clear purpose. Keep in mind the message you want to convey when creating your infographic. Throughout the process ask yourself, is this the message I wanted to convey? If it is, great. If not, refine, revise, and update. Once you have an idea to share, scroll through infographic templates for inspiration. 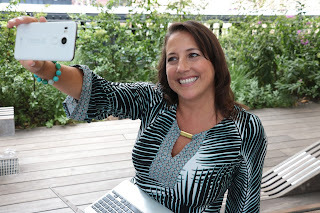 Find authentic audiences with which you can share your creation in digital media such as blogs, Twitter, and Facebook. Teachers can consider printing infographics out to post around the classroom and all bulletin boards. Pro tip: Add a QR code where viewers can go for more information. Whether infographics are created in your classroom, school, or district, Eileen says that students prefer consuming content where they know the source. Think of it like locally sourced food, but in this case, it is locally sourced information. Students also like infographics because they are visually appealing, or if we stick with the food analogy, rather than bland and processed, graphics are the condiments that allow us to season words and text to perfection. Here are some of the infographics Eileen mentioned in the podcast.